For more than 20 years, buildings have been rising constantly on the eastern edge of Upper Wacker Drive past Columbus Drive with Cityfront Center on the north side of the river and Lakeshore East coming up on the south bank. 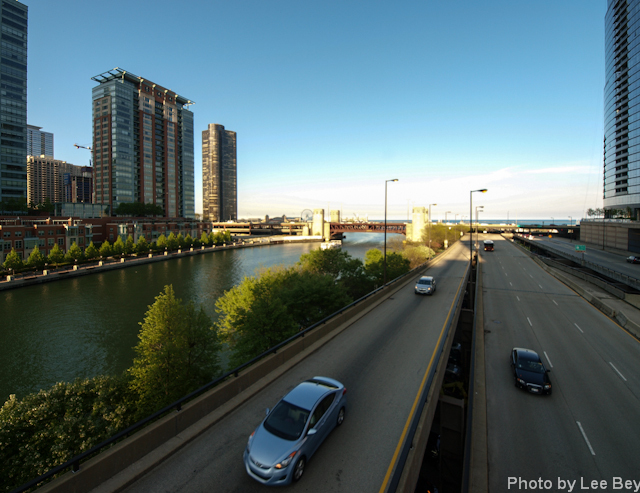 But now, a noteworthy subtraction: A Lakeshore East sales trailer that for years sat where Upper Wacker Drive dead ends about a block east of the Swissotel is gone now, giving the public a nicely elevated overlook where sky, water and architecture meet. Lots of architecture, too. Turning in place you can see the work of Mies van der Rohe, Dirk Lohan, Harry Weese, Graham Anderson Probst & White, SOM and more. You can see Tribune Tower, the understated/underrated Blue Cross/Blue Shield Building, Lake Point Tower, Aqua Tower, Trump Tower, NBC Tower and more. And there is more to come. 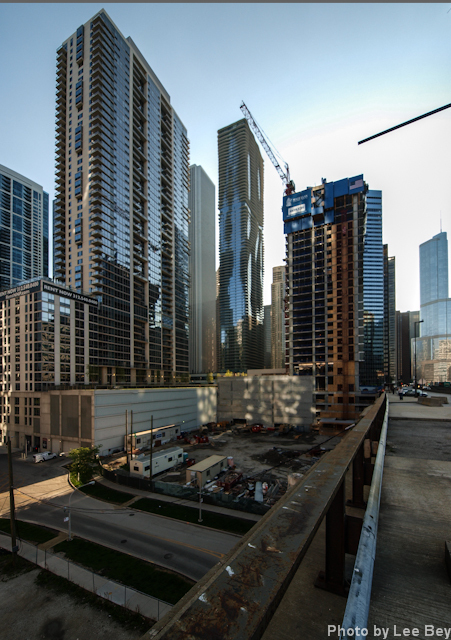 Just to the right in the photo below, you can see the 49-story Coast under construction at Lakeshore East. The Chicago River is right there and Lake Michigan is close enough to see, as are the beautiful Art Deco structures of the Lake Shore Drive bridge over the river--once the longest and widest bascule bridge in the world. It&apos;s a relatively serene spot, given there are two levels of Wacker Drive below. The cleared sidewalk makes for a decent-sized plaza about three traffic lanes wide. And because of the dead end, it&apos;s a road seldom traveled except by those looking for metered parking along Upper Wacker. 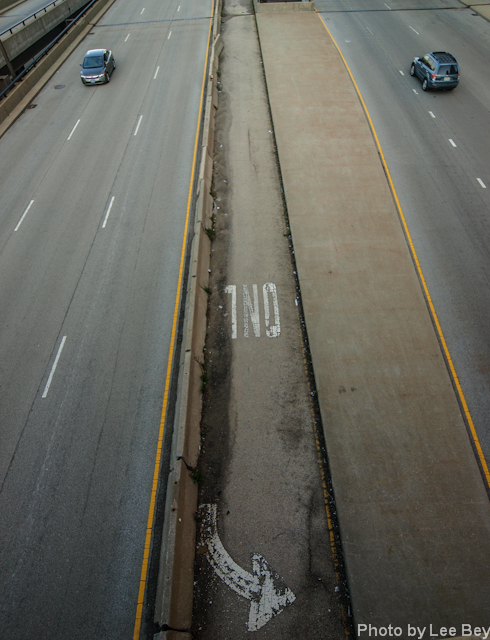 Looking over the edge of the railing onto Lower Wacker was fun. You can see an old turning lane--now blocked off--from one of the roadway&apos;s previous iterations. What could become of this spot? A Chicago Department of Transportation official this morning said there were had no plans for the site. But based on my inquiry, she said the agency would investigate putting a pocket park there.